Staff, volunteers and residents across our homes at Friends of the Elderly will be welcoming the local community into our care homes for Care Home Open Day 2018. 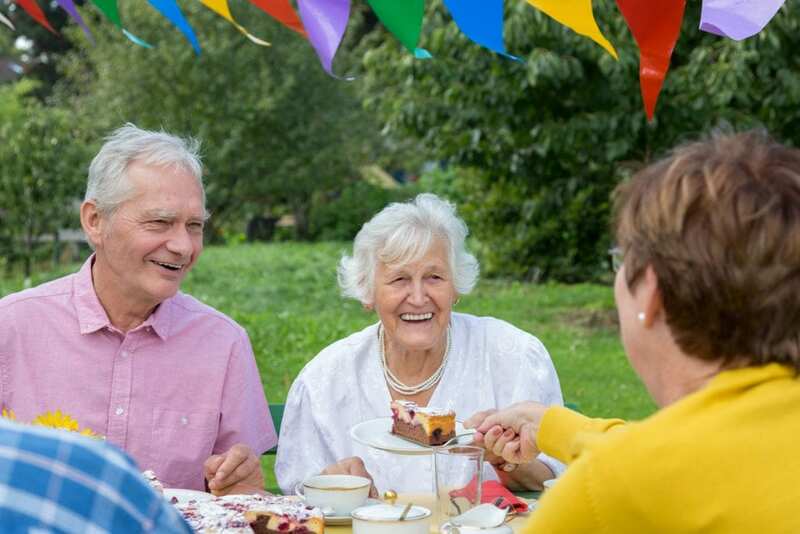 This special event is part of Friends of the Elderly’s ongoing commitment to fostering meaningful activities, encouraging friendships across the generations and placing its care homes at the heart of their local communities. It also helps mark the charity’s ongoing support for Care Home Open Day. Everyone is welcome to join us. Please find participating home’s events below. For more information please take a look at www.carehomeopenday.org.uk. Visit Retired Nurses National Home between 2.30 – 4pm for a performance by singer and guitarist Keith Turner, followed by a chance to meet our residents, staff and volunteers accompanied by tea and cake. Bernard Sunley care home in Woking, run by charity Friends of the Elderly, is opening its doors to the public on Friday 20 April as part of the Care Home Open Day initiative. Visitors are invited to drop in to the home between 11am and 3:30pm to join in with a range of activities, including watching a short film about the Royal family to mark our patron’s, The Queen, birthday, a visit from the Mayor, and from 2:30pm there will be afternoon tea with Pimms and live musical entertainment and a raffle. We’d like to invite you to our open day which will start at 12noon and finish at 3pm. Join us for special entertainment, for the chance to meet our residents, staff and volunteers and explore our care home. The Lawn care home in Holybourne, run by charity Friends of the Elderly, will be celebrating the Care Home Open Day initiative over two days this year. On Friday 20 April, visitors are invited to drop in to the home between 10:30am-12pm or 1:30pm-3pm to join residents and staff for light refreshments. The following day, on Saturday 21 April, the local Rock Choir will be at the home from 12pm providing entertainment to residents, staff and guests. Join us for live entertainment and afternoon tea from 2-4pm, where you’ll have the chance to meet our residents, staff and volunteers and explore our care home. Our open day will start at 12:30pm where there will be a chance for you to meet our staff, residents and volunteers alongside exploring our lovely care home and grounds. There will also be live classical music, a buffet for you to enjoy and a display of our year so far. Perrins House, Davenham and Bradbury Court care homes in Malvern run by charity Friends of the Elderly, is opening its doors to the public on Saturday 21 April as part of the Care Home Open Day initiative. Visitors are invited to drop into our homes on 21 April from 2.30-5pm to join residents, staff and volunteers for a Royal Tea Party at Perrins House plus at Bradbury Court and Davenham we will be having a tea party and a broadway musical singer. Keep checking this page for additional Care Home Open Day 2018 events. We are always delighted to hear from people interested in care options on behalf of an older relative, friend or loved one, or who are interested in working or volunteering with us. If you’d like to get in touch with us please click here. We join all our Friends of the Elderly colleagues in wishing everyone a very happy and successful Care Home Open Day 2018, and we look forward to welcoming our local community to our care homes soon.